Sedgwick County had fewer jobs in 2017 than in 2016. The Bureau of Labor Statistics has released new data for the Quarterly Census of Employment and Wages. This represents data for the complete year of 2017, on a preliminary basis. 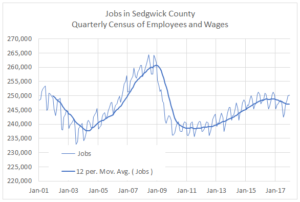 From December 2016 to December 2017 Sedgwick County employment was level, changing by 0.0 percent. According to the BLS news release, that ranked 317 of the 347 largest counties. Showing monthly value with strong seasonality, and 12-month trailing moving average. Click for larger. 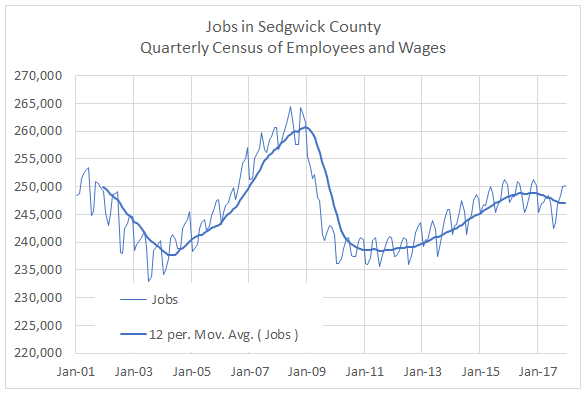 Using the monthly average job count, Sedgwick County had 248,772 (monthly average) jobs in 2016. For 2017 that fell to 247,022, a decline of 1,750 jobs or 0.7 percent. 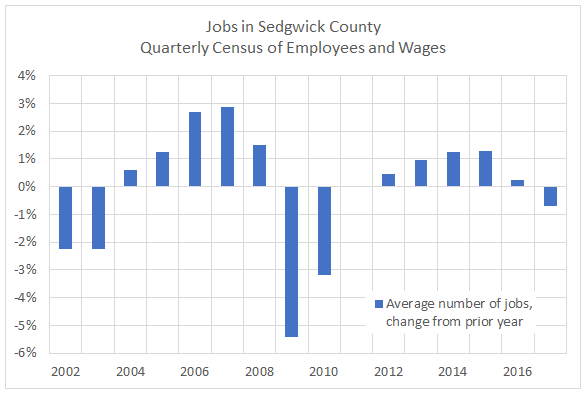 As can be seen in the chart of change in job levels, 2017 continues a trend of slower job growth in Sedgwick County, with the growth trend turning negative. Looking at these statistics, it’s difficult to see how anyone could come to these conclusions. Source of data is Bureau of Labor Statistics, Quarterly Census of Employment and Wages, specifically series ENU2017310010: “All Employees in Total Covered Total, all industries for All establishment sizes in Sedgwick County, Kansas, NSA.” Data through December 2017.